The rain gauge located at Walhalla State Fish Hatchery in Jocassee that observed the wettest year in the area. If it seemed like you were pulling out the raincoat and umbrella way too often during the 2018 Holiday season, you were correct. Preliminary data for South Carolina indicates December was the second wettest out of the 124-year record, with a statewide average rainfall of 7.67 inches which is almost double the normal rainfall of 3.56 inches for December. Griffin commented, “The 123.45 inches is a staggering 37.69 inches above their normal annual rainfall. It wasn’t one big event or even one big month, but an overall pattern of much above normal rainfall throughout the year. By February 2018 they had already accumulated over 21 inches of rain. The 17.74 inches received in May did set a new record for their wettest May. They also had excessive rainfall in July, August, November and December. 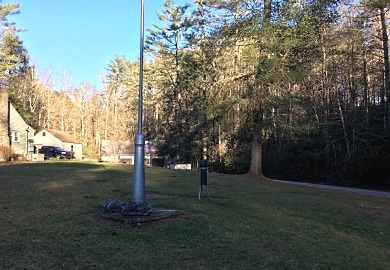 The Jocassee station is one of the over 8,000 National Weather Service Cooperative (COOP) Weather stations that provide daily observations of temperature and precipitation across the United States. The measurements provided by these citizen volunteers have provided the data that serve as the backbone of the nation's climate record.